In my article on Ron Unz’s “The Myth of American Meritocracy” I noted that it did not get much buzz in the above ground media. But Unz managed to get a brief comment in the New York Times “Room for Debate” feature (“Fears of an Asian Quota in the Ivy League“). Unz uses some of the data from his article to make the case that indeed discrimination is involved (“Statistics indicate an Ivy League Asian Quota“). The only noteworthy comment was by Jeff Neal, director of university communications for the faculty of arts and sciences at Harvard. Neal attempts to combat the weight of statistics by assurances that admission is based on reviews that are “individualized and holistic.” In other words, they are completely opaque, so they can do what they want. And the result is a very large underrepresentation of Asians and the much larger underrepresentation of non-Jewish Whites controlled for academic achievement. Given the debate topic, I guess it’s not surprising that the massive Jewish overrepresentation compared to Whites is not considered. But then one wonders why this isn’t considered to be a valid topic for the “Room for Debate” forum. In the debate on Asian quotas, S. B. Woo was something of an official Asian spokesman, representing the 80-20 National Asian American Educational Foundation. Not surprisingly, he concluded that it was obvious Asians were being discriminated against. It would be easy to find Jews to defend Jews, but the Times would doubtless shrink from the very idea that there could be a spokesperson for the interests of non-Jewish Whites. Unz’s other big point is that Jews are vastly overrepresented at elite universities and that Jewish achievement has collapsed. In the 1970s, for example, 40 percent of top scorers in the Math Olympiad had Jewish names. Now 2.5 percent do. The fanatical generations of immigrant strivers have been replaced by a more comfortable generation of preprofessionals, he implies. Well, there’s another big point in Unz’s article—that non-Jewish Whites are vastly underrepresented compared to Jews. Indeed, compared to Jews, non-Jewish Whites are represented at 1/15th of the level they would be in a meritocratic system. And Brooks never even attempts to fathom why the comfortable generation of preprofessionals continues to be so vastly overrepresented given their unstellar academic records. Another big point that is missing from Brooks’ comment is that the fact that Jews are predominant in the higher reaches of the administration of Ivy League universities is doubtless part of the reason for the favoritism toward Jews in university admissions. But, given Neal’s assurances, I am absolutely certain that the holistic and individualized system in place at Harvard is entirely fair. Neal proudly notes that Harvard has submitted a brief supporting holistic admissions criteria in the Fisher vs. University of Texas case that is currently before the Supreme Court. On the basis of Unz’s data, it’s apparent that the holistic admissions process is a way for elite universities to simultaneously admit Blacks, Latinos and Jews at much higher rates than they would on the basis of academic qualifications, while discriminating against Asians and non-Jewish Whites. 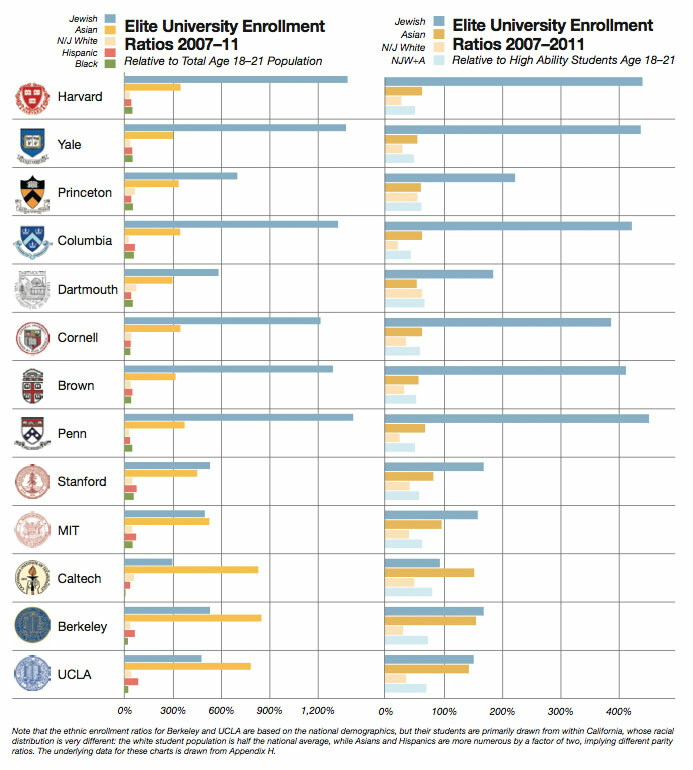 Indeed, the left side of the following figure shows that on the basis of total college-age population, non-Jewish Whites are underrepresented compared to Blacks and Latinos at Harvard and Yale as well as several other elite universities. The right side of the figure shows that non-Jewish White underrepresentation is far more glaring when one includes only high ability students. The displacement of White elites is well underway. There are many mechanisms for this, but clearly the use of holistic admissions to elite universities is an important one.